IS06 Abstracts are available for DOWNLOAD. Current developments in the technology of imaging have led to an explosive growth in the interdisciplinary field of imaging science. With the advent of new devices capable of seeing objects and structures not previously imagined, the reach of science and medicine has been extended in a multitude of different ways. The impact of this technology has been to generate new challenges associated with the problems of formation, acquisition, compression, transmission, and analysis of images. By their very nature, these challenges cut across the disciplines of physics, engineering, mathematics, biology, medicine, and statistics. 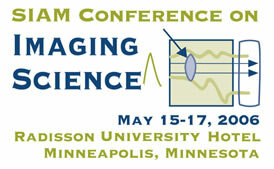 While the primary purpose of this conference is to focus on mathematical issues, the biomedical aspects of imaging will also play an important role.